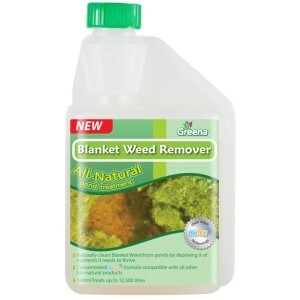 This fantastic all natural pond treatment for removing blanket weed works by naturally clearing the weed from ponds by depriving it of the nutrients it needs to thrive. Made in the UK, this blanket weed remover is made with concentrated, naturally occurring bacteria selected to consume and break down waste in your pond. Using BioTek™ clean water technology it really is a miracle worker. Use weekly for the first month and then once a monthly to maintain clarity. It is completely harmless to plants, fish and wildlife. The 500ml bottle is enough to treat up to 12,500 litres so this will last you a long time.